Les Cannadienne’s offense dominated the game in a 5-1 win. Photo Daren Zomerman. 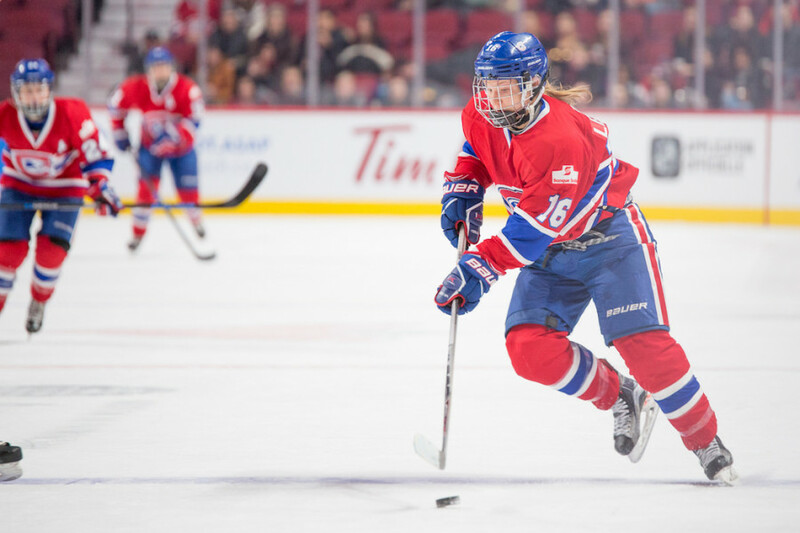 Les Canadiennes took on the Markham Thunder at Bell Sports Complex Saturday afternoon and were able to pull away with a decisive 5-1 victory. “We played well in every aspect of the game,” said head coach Dany Brunet. “We put a lot of work on offense this week trying to establish traffic in front of the net.” This strategy paid off as the Fabs scored four out of their five goals on rebounds. The Oct. 20 matchup marked the first meeting between the two squads since Markham eliminated Montreal in the playoffs last season. It didn’t take long for Montreal set the pace of the game. Their first shot was a quality chance on net for last season’s star acquisition, Hilary Knight. A regular on the United States’ national team, Knight scored her first goal as a Canadienne off a rebound in the first period. She didn’t miss the chance to laud her new organisation when asked about her adaptation process. Knight’s praise could easily be applied to her team’s superb penalty kill. The Fabs finished the game with a perfect record when playing down a woman. One of those penalty killers, Jillian Saulnier, had a strong performance for the home team. The veteran scored her first goals of the campaign. One of them, a superb backhand on a quick rush for Montreal beating Markham’s goaltender Erica Howe over the shoulder in the second. This was game one of two game battle against the Thunder this weekend. Photo Elisa Barbier. Saulnier is only one of five Canadiennes players to represent their country at this year’s 4 Nations Cup in Saskatoon. Joining Saulnier, on Canada’s National Team, are team captain Marie-Philip Poulin, goaltender Emerance Maschmeyer and forward Mélodie Daoust. Knight will also be making the trip to represent the United States. The 4 Nations tournament will get underway on Nov. 6 as the United States takes on Finland and Canada takes on Sweden. It won’t be the first time Knight dresses up to face Canada, but it will be a first since she was acquired by the Canadiennes’ organization. Friendships have never been a part of the intense on-ice rivalry that exists between the two nations. The United States took home the gold medal at last year’s tournament. Something the Canadians are looking to turn around this year. Poulin, Canada’s captain, doesn’t think the matchup against the United States is a lock for the final. Poulin strongly believes the key to her nation’s success will be their work ethic. She praised her national teammates heart and passion on the ice. The olympian alluded to the privilege she and her teammates had of wearing the maple leaf on the jersey in international competitions. But it is much more than an honour for canadian national players. It is also an opportunity to reunite with foes from rival Canadian Women’s Hockey League team. 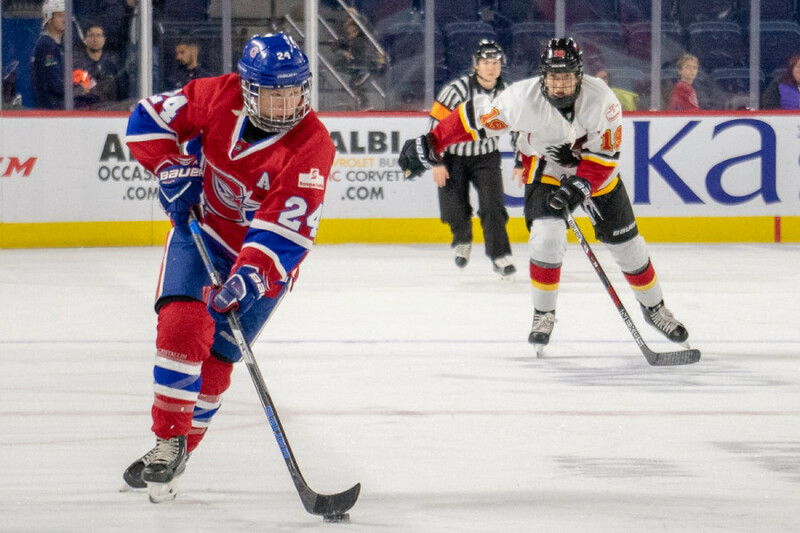 As for the Canadiennes, they will be facing Markham once again on Sunday, this time at the Claude-Robillard Sports Complex starting at 1:30 p.m.